Not too little, not too much: this, to me, exemplifies perfect wrist stacking. This look is something you can pull off day in and day out. It's subtle, uncontrived yet statement-y. But it all hinges on that beautifully retro, elegant round face watch, which is by Daniel Wellington. It looks way more expensive than its $229 price tag. And I love that it's as interchangeable as any other outfit-finishing bracelet. For less expensive options, check out these from Kate Spade, Asos, and Kenneth Cole. The bracelets you can find here, here and here. Just ordered the watch from the DW web site in Sweden. Been looking for a watch that will look good with my gold bracelets. Can't wait to get it. Thanks! 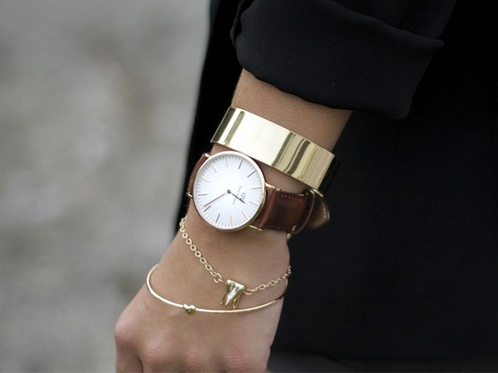 Definitely the perfect way of wrist stacking! Looks super modern! The heart bracelet is not the one shown on her wrist. I want THAT one please.